The first time Ed Peters brewed St. Camilla’s Honey Brown Ale was for the birthday of the cousin of a friend (named Camille) that he had only met once. He brought a keg of brown ale and a keg of root beer. 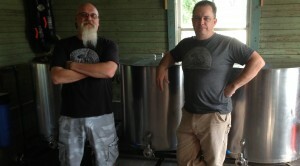 Now, St. Camilla’s Honey Brown Ale is one of the year-round offerings at Bastrop Brewhouse. Ed describes the beer as based on a Northern English brown ale, but bigger and tweaked to match the birthday girl’s taste. The beer is smooth and chocolately, and nicely balanced with English hops. Bastrop’s water has a lot of carbonates (~250 ppm HCO3–) and a fair amount of calcium (~80 ppm Ca2+). Ed adds phosphoric acid to drop the pH of the brewing liquor to 6.3–6.6. For the mash, Ed adds 0.14 oz. CaCl2 and 0.11 oz. CaSO4 to achieve a mash pH 5.3–5.5. Mash at 153 °F. Sparge with 170 °F water. Boil for 60 minutes, adding hops at times indicated. Add honey just before knockout. Cool to 66 °F. Pitch yeast and ferment. For the mash, Ed adds 4 g CaCl2 and 3 g CaSO4 to achieve a mash pH of 5.3–5.5. Mash at 67 °C. Sparge with 77 °C water. Boil for 60 minutes, adding hops at times indicated. Cool to 19 °C. Pitch yeast and ferment. Steep crushed grains for 45 minutes at 153 °F in 4 qts. of water. Rinse grain bag with 2 qts. of 170 °F water. Add water to make at least 3 gallons, stir in roughly half of the malt extract and boil for 60 minutes, adding hops at times indicated. Add honey and remaining malt extract just before knockout. (Dissolve these in some hot wort from your brewpot first.) Cool to 66 °F. Pitch yeast and ferment. Steep rushed grains for 45 minutes at 67 °C in 3.8 L of water. Rinse grain bag with 2 L of 77 °C water. Add water to make at least 11 L, stir in roughly half of the malt extract and boil for 60 minutes, adding hops at times indicated. Add honey and remaining malt extract just before knockout. (Dissolve these in some hot wort from your brewpot first.) Cool to 19 °C. Pitch yeast and ferment.